Bible school 12 pack. 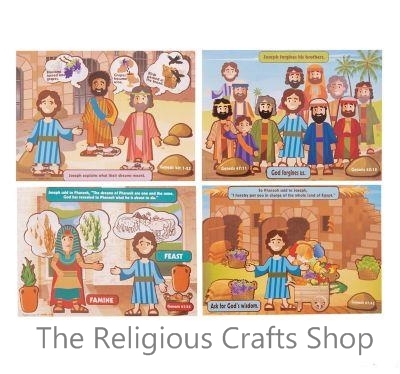 An easy and fun activity to bring the Story of Joseph to life. Always popular in churches and schools. Children love to arrange the stickers to make their story sequence of four pictures. Sticker sheet measures 18cm by 12cm. Each pack has 4 x 3 background sheets and 4 x 3 sticker sheets to create the four scenes.